Songs of Freedom host and producer Joel Landy was directing education at a computer learning center in addition to his regular job as a software instructor. The extra money was good and certainly appreciated, but after 18 months of scheduling classes, hiring instructors and turning the failing program into a successful source of income for the New York Macintosh User Group, he needed something else to do instead. "I put down the computer meetings and status reports and picked up a guitar again. Just like that. It was like turning a page of my life and starting another chapter." Joel says. "I had been wanting to produce a television show celebrating the dignity of human struggle, with artists and activists as the guests, sharing their vision of the world." The Macintosh User Group had its own TV show at that time seen on the public access channels in Manhattan. Chris O’Rourke crewed on that show and became certified to produce a show of his own. Joel spoke with Chris about his idea for a show. Soon after, Songs of Freedom made its premiere on the Manhattan Neighborhood Network. The date was July 11th, 1996. "We shoot on tape now in a three camera studio. That first show was a live one camera shoot. God, it was terrible! I tend to move around a lot and you can’t do that with a one camera shoot. We certainly learned what not to do!" That was almost four years ago. Since that time, Songs of Freedom has played in Manhattan every other Thursday night. The show is also seen every week in Queens and Brooklyn, and has won two prestigious "Hometown Video" awards for excellence from the Alliance for Community Media, the People’s Music Network of the public access world. This month the 100th episode of the show will be seen in New York. "The show embodies the spirit and essence of what we strive for here at the People's Music Network, and gives voice to views we don’t see in the mainstream media." says Joel. Indeed. The list of guests over the years has been a regular who’s who of PMN membership – Eric Levine, Matt Jones, Pat Humphries, Charlie King, Marc Levy, Heather Lev, Ellen Davidson, Faith Petric – just to name a few. Beyond music, shows have featured interviews with activists working passionately on issues ranging from dismantling the Pentagon and nuclear industry to the saving of redwood trees and the Tibetan culture. So, who’s watching public access television? "You’d be surprised," says Joel. "With remote controls and thirty second attention spans, if you have a good time slot there is a good chance you will be seen. Unfortunately, many people still think of public access as ‘Wayne’s World" – a land of half-baked productions, vanity videos and low technical values. Granted, that does exist, but if it looks like anyone can be doing this, that is the point! Anyone can make electronic messages and be seen and heard. You don’t have to be a millionaire or a billionaire ordained by some official authority. Other than the internet, public access TV is the only electronic public forum where millionaires and billionaires do not dictate what you see and hear. It is precious and needs to be protected. And celebrated." To that end, Joel has written what he calls, "the unofficial anthem of the public access movement." He re-wrote Woody Guthrie’s "This Land Is Your Land." It is now, "We Are All Able to Program Cable." "We are all able to program cable. Each town, each hour, we have the power. It’s about viewing what we are doing. Public access for you and me." Joel has gotten to sing the song at access centers across the country and at first amendment rallies. So, what’s next for Joel and Songs of Freedom ? "More shows, more issues and keep making television every two weeks! Some other parts of the country have expressed interest in the show. I think of Oscar Brand doing his radio show for so many years. I would like to do that with video and document the passionate activists and artists of our generation. It is a gift to all of us to declare they were here." 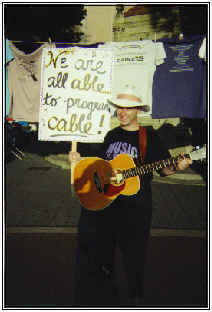 If you are interested in bringing Songs of Freedom to your town or want to know more about public access television, call Joel at 718-937-2240, or email him at joellandy@yahoo.com, or visit his website at http://joellandy.tripod.com.